If you ever thought I’d leave bananas alone for another year or so, please pretend these words never existed while we take care of the cake you see above. No evidence will remain and we won’t even have to tell the universe about it all. But if you’re anything like us, then I guess it’s a whole other story. 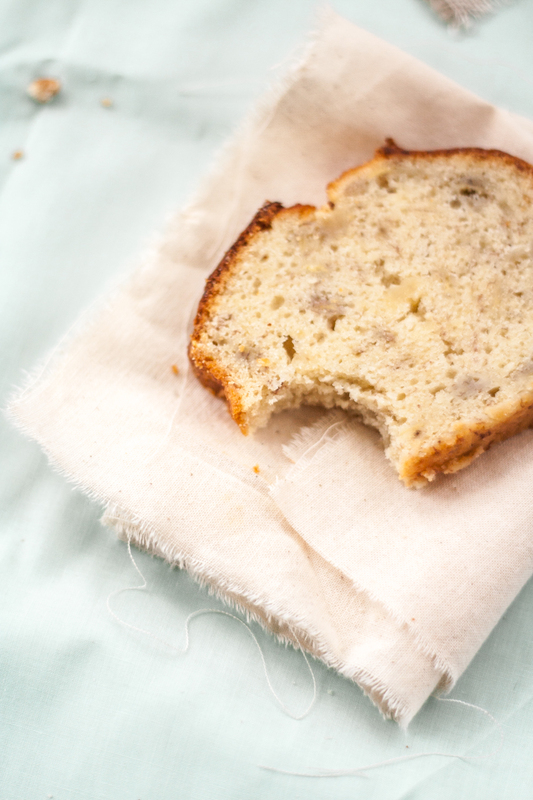 Yes, in our house, banana cake happens (a lot) and – more likely than not – for a reason (black bananas). This one – unlike the loaf I told you about* a month or so ago – is my usual straight-to-the-point banana cake. With approximately eight minutes from the cupboard to the oven, it’s my favourite for weeknights when dinner has been eaten and the dishes are done; the oven is still hot from the mushroom lasagne we’ve just made; and we have for only music, the sound of the wind through our windows. (For the record: yes, the pastry chef in me cringes at the thought – and the act – of baking a cake right after lasagne – or anything savoury, for that matter. But you see, such things are easily overlooked when you have to read/understand/translate fifty book pages for the next day. Yes, this whole learning-Swedish side-project sort of turned into a full-time thing. And really, jag kan knappt vänta [I can hardly wait]). Over the years, I’ve gotten a lot bowls dirty with this recipe – not that it takes more than one to mix the batter. A lot of mileage too. From the slice eaten for breakfast to the one – microwaved just so and – served with a fat scoop of yoghurt sorbet for dessert. In my notebook, I’ve called it brutally honest banana loaf cake. 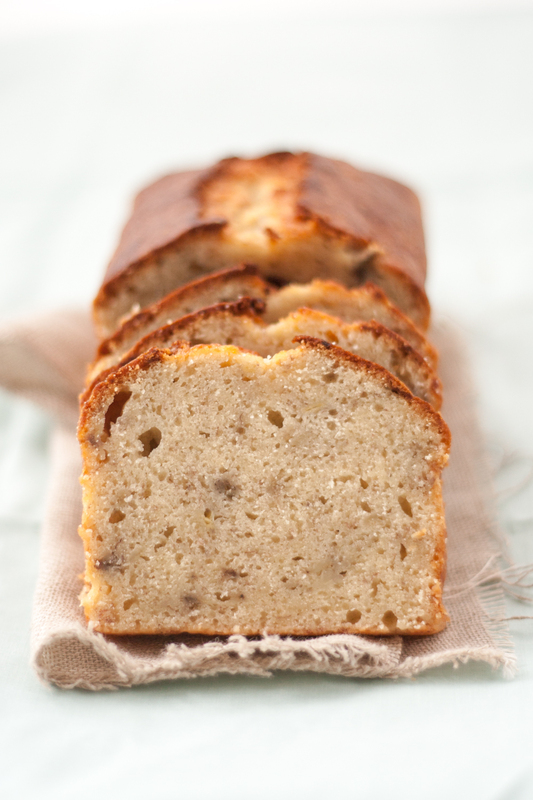 And it is – true to its name – a moist yet with a fine crumb, flavourful loaf cake. The batter can take from 3 to 6 bananas (300 to 600 grams, peeled), depending on the state of your fruit bowl. The one you see here was made with only 3 and although I do prefer the custardy flavour of the banana-loaded version, I do love this one too. For the first time – ever – I made this recipe using filmjölk but you could use buttermilk, natural yoghurt (which I prefer over Greek yoghurt here for its sharper flavour), or even milk. As you must ALL know by now – since I spend around three-quarters of my days telling everyone and their neighbour – I like to pipe a thin line of soft butter on top of my unbaked loaf cake to get a neat crack in its centre. When it comes to loaf cakes, I always bake them at high temperature and then reduce to finish the baking. I usually do 5 minutes at 180°C, 10 minutes at 170°C, and 25-30 minutes at 160°C. However, for banana cakes, I’ve found I get better results with 20 minutes at 180°C and then around 30 minutes at 160°C. *PS. It doesn’t mean I don’t worship the recipe I previously shared with you. I do, but they’re very different. And I love having many solid basic recipes. I hope you won’t mind! Preheat the oven to 180°C and line a loaf tin with baking paper. Mix the flour, baking powder and salt in a small bowl, and set aside until needed. In a large bowl, cream the sugars and butter for around 5 minutes, or until light and fluffy. Add the eggs, one at a time, mixing well after each addition. If your batter splits a little, simply heat it (either over a pan of simmering water – make sure you’re using a heatproof bowl – or by flashing it in the microwave for 10-20 seconds). Mix in the mashed bananas and yoghurt. Then add the flour mixture at once, folding it in until just combined. Scrape the batter into the prepared loaf tin filling it 3/4 to the rim – and if needed in a few muffin cases too (which I then bake on the same tray as my loaf, but only for around 20 minutes, see note above). Bake for 20 minutes at 180°C and then reduce the oven temperature to 160°C and bake for a further 30 minutes, or until golden-brown and the tip of a knife inserted into the centre of the cake comes out clean. 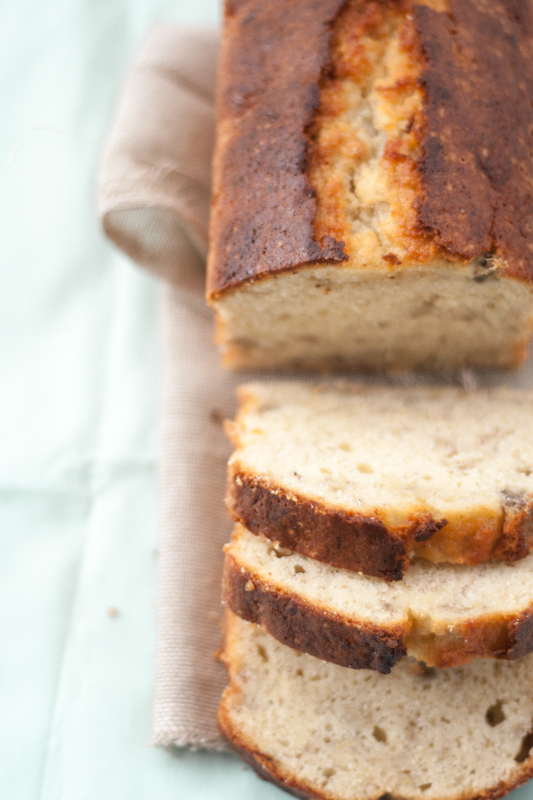 Please feel free to publish as many variations of banana loaf/cake as you like! I somehow manage to miss your previous post but have to say that I am impressed by the notion of roasted banana in the mix! Having looked at both recipes, they will each find their way into my ovens but I am equally tempted to tweak the roasted banana cake with some different honeys. I have one particular honey in mind that has completely blown my socks off – so to speak! It is a chestnut raw honey, distributed by Seggiano. I can only describe it as a sweetened chestnut liqueur or eau de vie. It is so delicious that it beggars belief! A little trickle of this over the bananas on my morning cereal is sheer perfection. Sorry! Way too much rhapsodizing over this mahogany nectar! On to another matter close to my heart – cake! The simple tweak is to use the chestnut honey and perhaps some chopped chestnuts for texture (the nice vacuum-tinned ones by Clement Faugier) – What do you think? Just in case you haven’t seen it, two of my favourite banana loaf and cake recipes come from a special book – ‘Warm Bread & Honey Cake’ by Gaitri Pagrach-Chandra. Do you have it? If not, I am sure that you would like it. Good luck with your studies – fortified by Fika! I’m thinking we should make a chestnut-chestnut cake. With chestnut paste and crumbled candied chestnuts, chestnut honey ! and a heavy hand on vanilla and rum! I’m going to check this honey now as you make it sound about more appealing than anything I’ve found appealing before! And while I’m at it, thank you for telling me about this book. I had never heard about it before but I have a feeling I will love it. I made this the other day and it was awesome! Tastes great! Might be nice with some chocolate, honey, or cinnamon! Delicious! Wow this looks really good and very quick which I love! Thank you can’t wait to try this out! Yes it is. And the recipe is a keeper. I’ve been making it for years for almost-instant gratification. Hiya! Just wanted to drop by and say that I love your blog, and I’m digging all you recent posts. I have a book coming out through Hardie Grant later this year, so I weirdly feel like we’re in a club together! Hi from Australia!